There are no user reviews for Codero. 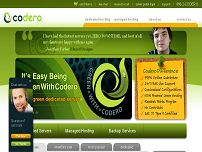 Codero is a dedicated and managed hosting company started in July 2009. The company was created drawing upon the 15 years of experience, knowledge and support of Aplus.net's dedicated server and managed services line. A trusted leader delivering comprehensive hosted solutions unique to each situation, our sole focus is on the IT demands of small- to mid-sized businesses. Dedicated Hosting services for small and medium sized businesses includes managed services, server backup, firewall hardware, and more. Codero was created drawing upon the years of experience, knowledge and support of Aplus.net which was started in 1992. The Codero brand was launched as the dedicated and managed hosting division of Aplus.net on July 31, 2009 and quickly became a standalone company and resourceful leader within the dedicated hosting industry. With a sole focus on the IT needs of small businesses, we satisfy demands for agile and efficient dedicated and managed hosting. Codero offers a full line of high-performance, value-driven Windows® and Linux servers located in data centers and backed with live 24/7/365 U.S.-based support. We provide an exceptional hosting experience for email, online shopping, data storage, backup, transfer and more. Fully managed dedicated server hosting is available for those businesses who desire more IT assistance as well as other flexible plans that can be customized for your specific needs. "IaaS provider: dedicated, managed and cloud hosting. Twitter account actively monitored M-F 8-5CT. All other times may experience a delayed response." We’ve been digging deep into The 2017 State of IT from Spiceworks, which reflects the attitudes and opinions of nearly 900 IT buyers as well as data from within its IT-based social network. Here are three stats that point towards the rising importance of hosting services for most businesses. 2% — the expected decrease in […] The post 3 IT Stats That Show Why Hosting Services are High Priority appeared first on Codero Blog. Let’s look at how you might select hosting options based on the factors that matter most to your business. Of course, none of these factors exist in a vacuum. In reality, the wisest choice for your business will be one that strikes the best balance for your unique needs. The X-Factor: Performance Here, we’re talking […] The post The Factors That Should Drive Your Hosting Decisions appeared first on Codero Blog. Can You Handle Hosting In-House? Here’s How to Know. Email, websites, apps, and data are crucial to most businesses today. And that means servers. Managing, maintaining, and optimizing those servers is a time-consuming proposition — one that will only expand as your business grows. Many SMBs feel that the way to keep costs low and control high is to keep everything in-house. But as […] The post Can You Handle Hosting In-House? Here’s How to Know. appeared first on Codero Blog. Is your AWS truly Resilient? If you host critical company infrastructure solely on a public cloud like AWS or Azure, you might be wondering how resilient that infrastructure is. After a major AWS outage, their largest region (Virginia) was affected for hours a few weeks ago. Large organizations like SnapChat and NetFlix were affected, as were many small- to medium-sized […] The post Is your AWS truly Resilient? appeared first on Codero Blog. Did A Single Keystroke Take Down Amazon? The current readout on the eastern region outage of Amazon’s popular AWS cloud service is that it was caused by single technician’s errant command. The four hour outage caused downtime for many large websites and apps that depend on the service – including Netflix, Slack, and the SEC. It also made headlines in all the […] The post Did A Single Keystroke Take Down Amazon? appeared first on Codero Blog. Is Your Online Backup Compliant? Compliance Regulations for Data Nowadays online backup has become in vogue thanks to a combination of faster, cheaper bandwidth and the increased need for off-site backups. In fact, in many ways online backups have greatly improved the practice of disaster recovery. However, if your company is one that falls under any regulation or standards body, it could […] The post Is Your Online Backup Compliant? appeared first on Codero Blog. If you’re looking at lowering your IT costs by shifting more workloads to the cloud, you’re definitely on to something. Operating in the cloud – particularly hybrid cloud – can reduce infrastructure costs, allow you to “pay as you go” for many services and save your business money in other important ways. But. (And it’s […] The post Management tools that will make cloud computing pay off appeared first on Codero Blog. According to a recent survey of IT professionals, 75% report they lack visibility into their hybrid clouds. That’s cause for concern, because a lack of visibility into resources in the cloud can lead to poor management of those resources – which in turn can lead to a variety of unwanted and potentially disastrous consequences. Here […] The post 3 big problems with lack of visibility in the cloud appeared first on Codero Blog. Ever carried a balance on a cash-back credit card? No? Congratulations – you’re a better money manager than a lot of us! But if you have, then you’re probably familiar with that feeling you get when you realize you just paid more in interest than you got back in cash. It’s the same feeling you […] The post Don’t let cloud sprawl wipe out your cost savings appeared first on Codero Blog. Note: This article is part two of a two-part series addressing eight essentials for a hybrid cloud implementation. Click here for the first article. Furthermore, this article presents supplementary information from the Codero whitepaper “A Comprehensive Overview of the Hybrid Cloud” which can be downloaded here. Hybrid cloud computing can deliver business agility and reduce operating […] The post 8 Critical Elements of a Successful Hybrid Cloud Implementation – Part 2 appeared first on Codero Blog. Note: This article is part one of a two-part series addressing essentials to a hybrid cloud implementation. For more info, download the Codero whitepaper “A Comprehensive Overview of the Hybrid Cloud”. Businesses looking for the best of both public and private cloud often choose a hybrid cloud environment. The benefits of a hybrid cloud are substantial […] The post 8 Critical Elements of a Successful Hybrid Cloud Implementation – Part 1 appeared first on Codero Blog. Implementing a hybrid cloud is an intricate process, requiring good planning and even better execution. Choosing a cloud provider can be a challenge in and of itself. The landscape of cloud vendors is highly varied – from the startups to the huge players and everything in between. It’s especially important to find a hybrid cloud […] The post 5 Key Concerns in Evaluating Hybrid Cloud Solutions appeared first on Codero Blog. Hybrid cloud adoption is up from 58% to 71% year-over-year, according to the RightScale 2016 State of the Cloud Report. There’s ample evidence that hybrid cloud will be the platform of choice for enterprises in the near future because of the wide array of benefits offered, including: Scalability Reduce cost by utilizing public cloud usage […] The post The 5 Biggest Considerations in Adopting a Hybrid Cloud Environment appeared first on Codero Blog. There are many discussions in recent events regarding the threat of vulnerable IoT devices. Part of the scare here is the ability of nefarious actors to unleash these devices in controlled botnets in strategic Denial of Service attacks. This is a very tangible threat that has manifested in a number of recent attacks including a […] The post The Coming IoT DDoS Storm appeared first on Codero Blog. Each new year heralds a round of prognostications, with various industry analysts and writers scratching their heads about what happened last year and what may happen this year. We’ve rounded up a list of predictions for you to consider – time will tell who had the best view into the crystal ball when it comes […] The post The Cloud Crystal Ball – A Round Up of Predictions for 2017 appeared first on Codero Blog. Distributed Denial of Service (DDoS) attacks have been around for years, but lately the threat potential has risen for a variety of reasons. One of the primary factors is the propagation of minimally secured Internet of Things (IoT) devices. DDoS attacks were initially simple to execute and protect against, but the attacks have become more […] The post Hosting in the Age of DDoS appeared first on Codero Blog. Is your host lazy? Here’s your 5 signs. Bandwidth and disk space are only a couple of critical decisions to be made when deciding on the ideal hosting partner. Simply put, hosting has many moving parts, and they all need to work in unison to deliver a first-rate, continuous service. Choosing a low cost provider […] The post The 5 Signs of a Lazy Host appeared first on Codero Blog. In its 15th year of business, Codero customer Hen’s Teeth Network is a “soup to nuts” provider of web design and web hosting company. Looking for more features, reliability, and better performance, owner Art Zemon moved his company to Codero’s infrastructure from Rackspace in 2013. Art has been really impressed with his Codero experience, specifically […] The post Codero Customer Highlight– Hen’s Teeth Network, Art Zemon appeared first on Codero Blog. VMware – What does it do and why hosting customers need it. Not long ago VMware revolutionized computing forever. Its virtualization software allowed companies to stack greater workloads than ever before onto enterprise servers. Moreover, it had widespread appeal thanks to an agnostic approach to working across numerous operating systems and hardware platforms. Fast forward to today’s world of enterprise computing. VMware has transferred ownership a few […] The post VMware – What does it do and why hosting customers need it. appeared first on Codero Blog. For those that have as little as a casual awareness of the private cloud, its benefits stand out immediately. Flexible, powerful, easy-to-use, global, and cheap, cloud services have had a transformative and measurable impact on businesses for a number of years. We can thank marketing efforts as well as visible elements of consumer technology all […] The post When a Private Cloud is the Answer appeared first on Codero Blog.